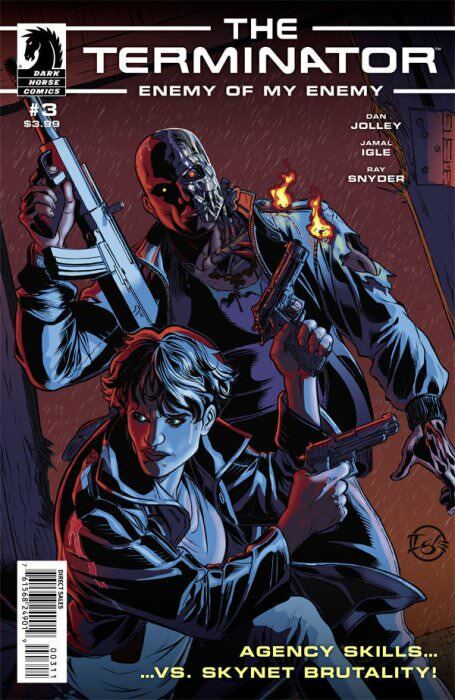 Except for an interesting run by NOW comics, Dark Horse has been the caretaker of the Terminator comic franchise. But like their other movie-based properties (Predator, Aliens, and Star Wars for a while), Dark Horse's Terminator offerings swing wildly in terms of quality. Some of them are fantastic and thought-provoking. Others are just plain bad. 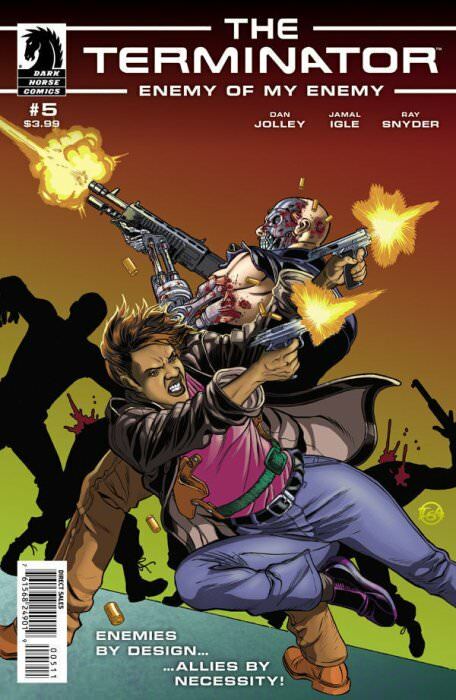 What we have here is a Mini that came out fairly recently (2014) and, according to interviews I've seen with the creators, trying to set itself apart from earlier offerings with asking the question of, "What happens when a Terminator arrives and there's nobody from the future to tell anyone what's going on?" An interesting idea. 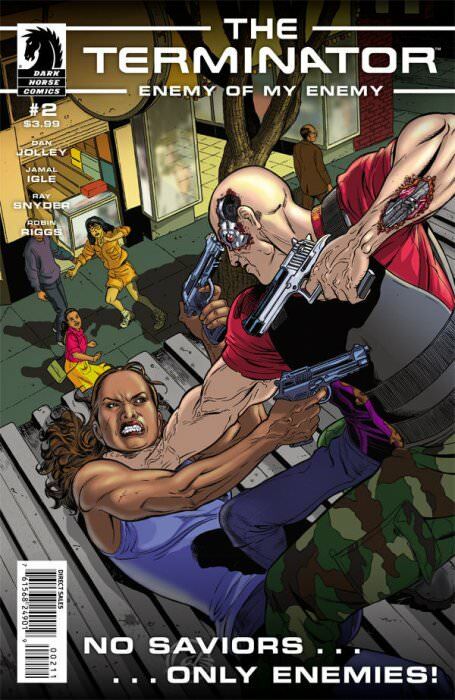 So. . .Is Enemy Of My Enemy one of Dark Horse's good Terminator stories? Let's find out! Farrow Greene, Ex CIA assassin - turned bounty hunter on the run takes on an assignment to track down and capture scientist Elise Wong. Unfortunately for Greene, her target is also being pursued by a deadly killing machine from the future. . .a Terminator. This first issue is mostly setup. It introduces the 3 main characters (Bounty hunter, Scientist and Terminator) and brings them together, then ends with a decent cliffhanger that makes me want to get right into the next issue. 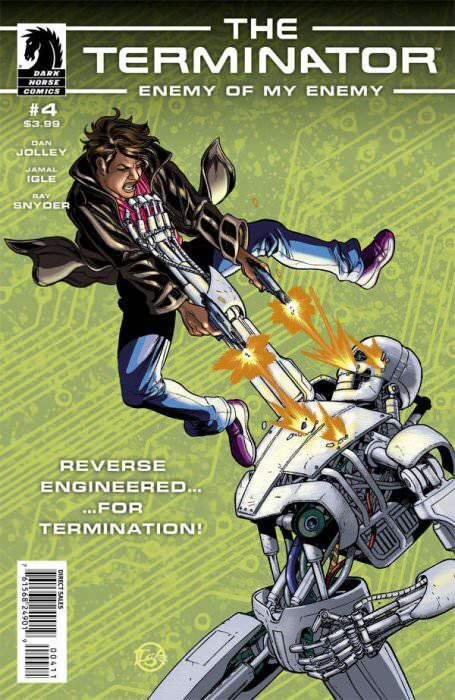 Although it's decently-written, and asks the interesting question of what happens when a Terminator comes around and there's nobody else from the future to 'splain just what the hell's going on, the main character seems like a bit too much of a "Mary Sue". In other words, she's an unrelatable superwoman with any plot-convenient powers she needs to have. . .definitely NOT the average person in a terrifying situation against an unknown enemy advertised in creator interviews. Just her basic description alone is enough to make the eyes roll: Ex-CIA special operative turned bounty hunter? Really? This is a normal person? Look. . .I'm not going to sit here and whine about "forced diversity" in comics and such, because I'm not that guy. But I WILL say that there IS a distinct whiff of overcompensation here in the female (check) gay (check) black (check) main character with any abilities needed to make it through any situation and leave it at that for now. Just be fairly warned that if you ARE that guy who boils over at all things SJW. . .this comic ain't gonna do your blood pressure a bit of good. Other than the laughably overqualified main character, this was a pretty good introductory issue. The art was really neither here nor there. . .it tells the story, but doesn't really stand out in any way. It runs right down the middle of the road. After tracking down and recapturing Dr. Fong, Greene learns that she is working on a method to produce artificial skin in the laboratory. Unfortunately, both the Terminator and a shadowy government agency are after Dr. Fong as well. . . I actually liked this issue better than the first one. The story is beginning to open up a bit more as we learn what sort of research Dr. Fong is involved in. It makes sense to the reader why Skynet wants her dead (she is building a failsafe virus into her artificial skin that can destroy it if it turns cancerous) but it makes no sense to the characters in the story because they still don't realize the brutal guy chasing them is a killing machine from the future. The addition of the government agency that knows a LITTLE about Terminators from the first "incident" (The original movie) is also interesting. The art also improves in this issue, with some really great action scenes as Mary Sue. . .er. . .Greene. . .shows off her martial arts mastery against the Terminator. 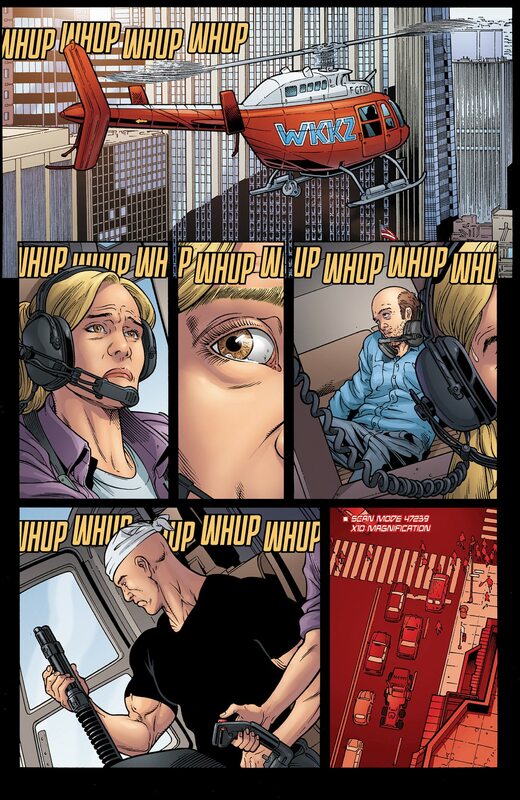 There's also a great set of silent panels showing the utter terror of a news helicopter pilot as the Terminator forces her to fly a search pattern over the city in search of Greene's car. Some good visual storytelling right there. . . Overall, even though I found this issue to be very enjoyable, I still find the main character to be a diversity checkbox superwoman with a skillset that Batman would be jealous of. Now THAT'S a sweet cover! After Dr. Fong is captured by a secret government agency wanting to use her as bait in order to lure and capture the Terminator, Greene makes a deal with the Terminator to team up and rescue the scientist. Things start to break down in this third issue. It's not off the rails quite yet, but there's a few "WTF?" moments to be found that don't bode well at the halfway point of this story. It starts off with a confusing sequence of Greene talking to herself in the apartment of a woman she's drugged while cutting her hair and changing clothes. It reeks of the writer trying to force some sympathetic exposition into the story, but it really comes off as "Of COURSE the superwoman has a tragic backstory. Of course she does." THEN there's how the Terminator decides to chase Mary Sue. . .er. . .former agent Greene. . .instead of tracking down his actual target Dr. Fong. It's out of character for a relentless Terminator to get sidetracked like that when it's already been shown that it has the resourcefulness to discover where Fong was taken without Greene's help. And finally, there's the "Deal" that Greene and the Terminator make to work together. It seems that it's the big twist in this story to try and set it apart. . .Terminator and Human working together. . .but it makes no sense, really. Whatever information Greene has could easily be gained by other methods by The Terminator. Like I said above, It's not QUITE off the rails yet. . .but this series is heading into a curve at an inadvisable speed. After a shadowy government agency captures Dr. Fong, The Terminator and Ex-Agent Greene come to an agreement to work together since neither of them alone can get to Fong. Agreeing that Fong's fate will be decided after retrieving her from captivity, Greene and The Terminator attack the compound where the scientist is being held. Most of this issue deals with Greene and the Terminator attacking a secret government compound where Dr. Fong is being held as bait to draw the Terminator out. . .so it's pretty much all battle action from beginning to end. That said, there's a nice scene at the beginning where Terminator and Greene are assessing each other's combat capabilities that has a bit of deadpan Terminator-style humor that I liked. It was also interesting to see that the government had been working on their own version of Terminators. . .crude and remote-controlled versions. Unfortunately, Greene continues to Mary Sue the hell out of things by adding sniper skills and the ability to survive an RPG blast to her already-expansive repertoire of superhuman abilities. Then there's the government proto-Terminators. Yeah, it was interesting to see that they were there. . .but their ability to take down a Skynet killing machine from the future was pretty ridiculous. Overall, this issue was better than issue 3. . .as long as you don't stop to think about motivations, plot holes, and the doubtful outcome of 1985 proto-Terminators defeating Skynet's best. . .and just enjoy page after page of a bada$$ Terminator tearing $hit up. So for awesome Terminator battle action, it's great. Storywise. . .it's turning into a mess. Former CIA Agent Greene and The Terminator are captured by the government, but manage to gain their freedom. Greene breaks her agreement with the Terminator and escapes with Dr. Fong, but the Skynet killing machine is in close pursuit. . . 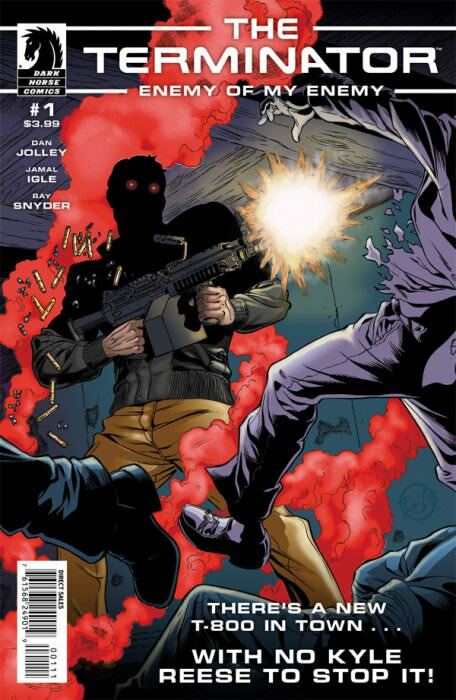 In the lead up to the final issue, things remain action-heavy as Greene and The Terminator escape the government compound with Dr. Fong after fighting their way past a room full of proto-Terminators. While she's knocked out, Greene has a flashback of the assignment that put her on the government's $hit list. . .she accidentally caused the death of another agent and outed a Soviet double agent at the same time. . .that was pretty interesting. But that's about all the story beats to be found in this issue. For some reason, the art takes a turn for the worse in this issue, with some truly horrendous panels, especially Greene's face. The flashback scene is nicely done, but for some reason it looks almost like two artists were working on this issue. What happens when an artist stops giving a F*ck. . . 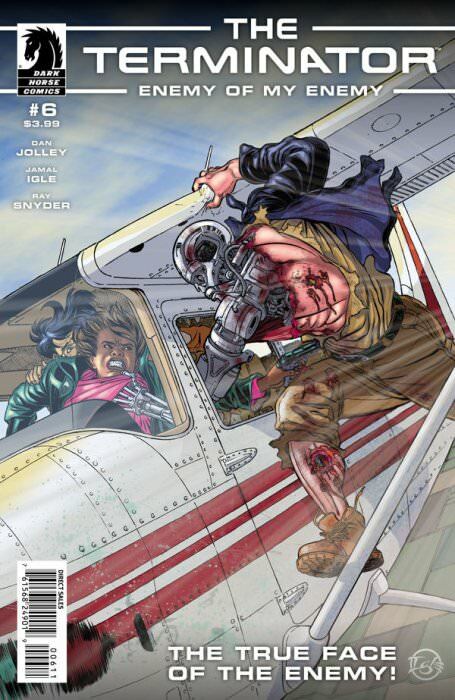 Besides the bad art, the continuing problem of the main character being an unrelatable superwoman doesn't fail to make an appearance in this issue, with Greene adding escape artist and pilot to her ability list and a laughable scene of her catching a hand grenade in mid-air and chucking it back where it came from. Overall, this series has been on a downward slide since the third issue, and this issue is one of the worst. The art is bad to the point of distraction in places and Greene's superhuman abilities are getting more and more ridiculous. After escaping with Dr. Fong, Greene returns to battle with the Terminator one last time. . . This series has been flirting with disaster since the 3rd issue, but this final issue finally sends it flying off the rails and over the cliff. 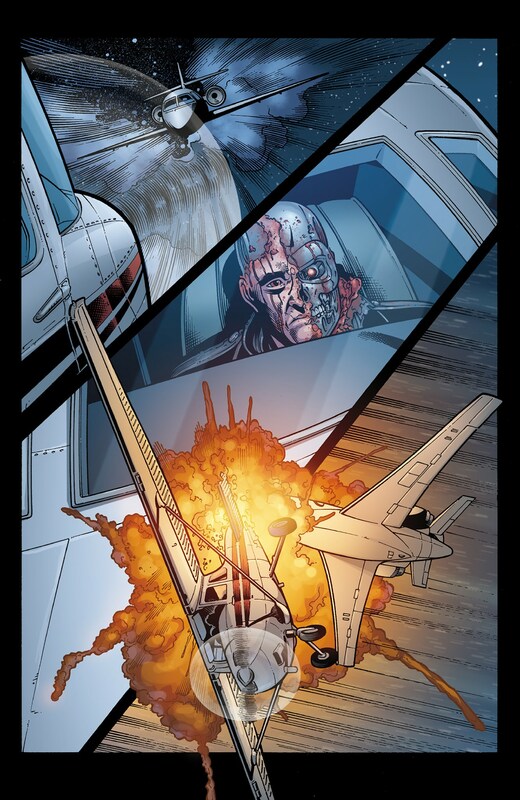 The main character being an unrelatable superhuman Mary Sue throughout this series comes to a laughable climax as she survives a midair head on collision with a jet. . .
What? That? Pff. . .walk it off. . . .And then adds skydiving and hot wiring cars to her plot-convenient ability list before topping it all off by quoting Robert Frost and firing multiple shots from a bolt action rifle. Former CIA Agent turned Bounty Hunter Greene Mary Suing her way through the finale is NOTHING compared to the final fate of Dr. MacGuffin Fong as she rams the Terminator with a car, only for it to reach through the windshield and gently tap her heart, rupturing her pericardium and giving her a heart attack. . .complete with gasping monologue about how her kidnapper (Mary Sue Greene) is really a good person inside. TERMINATORS DON'T "TAP" YOUR CHEST TO KILL YOU WITH A HEART ATTACK! THEY TEAR YOUR GODDAMN CHEST OPEN WITH THEIR FRIGGIN' UNCARING ROBOTIC HANDS AND RIP YOUR HEART OUT! TERMINATORS DESTROY. . .THEY DON'T "TAP". Fu*k this ending. Just. . .Fu*k it sideways. I love the Terminator franchise. Unfortunately, there's not much to love in this mini. It's not all bad. The art is pretty good until later on in issues 5 and 6 when you can plainly see the artist stop giving a F*ck. The concept is interesting. There are some awesome scenes of the Terminator in full out battle with government troops. There's also a diversity checkbox unrelatable superwoman main character with a plot-convenient skillset that expands with every issue. There are obvious plot holes around both the main character and the Terminator's motivations and actions. The ending is EXTREMELY weak. Overall, if you're just looking for some great battle action with a Terminator and a badass human teaming up, then this mini is good for that. If you're looking for a great Terminator story. . .not so good. This series had you bringing out the all caps and the f-bombs!! Too bad the ending sucked, but I'm still missing the 6th issue to complete the set, now once I find it I can just put it away. Good work Atom! Atom, please tell us what you really think! Just kidding. That was a great, honest review about a mini-series you REALLY wanted to like, but ultimately was a let-down.